Arcade Fire's Win Butler Dubs Digital Distribution "a Fad," Pledges to Remain an "Album Band"
Considering Arcade Fire's epic The Suburbs nabbed our top spot for pop & rock record of the year, it should come as no surprise that the group take pride in crafting a full-length. 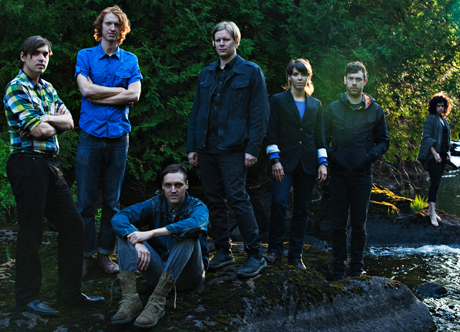 If you weren't convinced of that fact, a new interview with frontman Win Butler asserts Arcade Fire's allegiance to the LP format, as opposed to today's tendency to tout the ease of the one-click digital single. Speaking with the Scotsman [via Gigwise], the singer confirmed that he will always back the physical manifestation of music, claiming digital quickies are less likely to foster emotional attachment. "I've been moved by albums a lot more than I've been moved by singles. We're an album band; I'm not going to stop making albums because of some fad of digital distribution," he said. "The idea that you just have to make bad, cheap stuff and sell it cheaply because the format changes, to me, is crazy. It's more important than ever to me to have the artwork and the recording be as great as they can be." Despite physical album sales continually slowing down, Arcade Fire clearly did something right with their product this year. The Suburbs debuted at the top of the Billboard charts last summer and is currently up for a few Grammys, including Album of the Year.